Contico Container was founded more than 40 years ago and is now owned by Continental Commercial Products, L.L.C. Contico is a manufacturer and distributor of Consumer Products for Home, Auto and Outdoor applications. Contico primarily makes a wide range of Industrial packaging products ranging from a 1⁄2 gallon pail to a 55 gallon drum. Annual sales were $10 million at project start. CMTC was contracted to help Contico reduce costs and improve customer satisfaction by identifying opportunities to reduce energy and manufacturing costs, improve productivity and reduce lead times. Current and Future State Maps were created to identify opportunities to reduce energy and manufacturing costs and improve productivity by reducing lead times. Opportunities were identified in key areas involving the reduction of changeover times on injection molding machines and an offset printer, as well as the implementation of a Total Productive Maintenance (TPM) program. To address these improvement areas, the team decided to conduct three improvement events. The goal of the first improvement event was to reduce the changeover time on a high-volume injection molding press. Non-productive time during each changeover resulted in very large batch sizes, which in turn resulted in overproduction, excess inventory and handling. In addition, the machine idled during the changeover which resulted in substantial energy losses. The goal of the second improvement event focused on changeover reduction of the offset printer which was taking one hour per changeover. The problem was compounded by lack of storage space, multiple handling, damage and a large percentage of non-value added activities by its employees. The third improvement event focused on the implementation of a comprehensive Total Productive Maintenance program to improve the equipment reliability, reduce downtime and gain capacity. The project began in March 2005 and ended in June 2005. The injection molding press improvement reduced changeover time from 2.5 hours to 1.5 hours, which in turn generated a potential capacity to produce an additional 58,000 units of product per year from 13 production presses. The offset printer improvement lowered changeover time from 63 minutes to 29 minutes. The TPM implementation improved the Overall Equipment Efficiency (OEE) by 5%. Throughput sales are projected to increase by $58K as a result of increased capacity from injection molding machines. Lower work-inprocess inventory was projected to result in a savings of $11,576 annually. 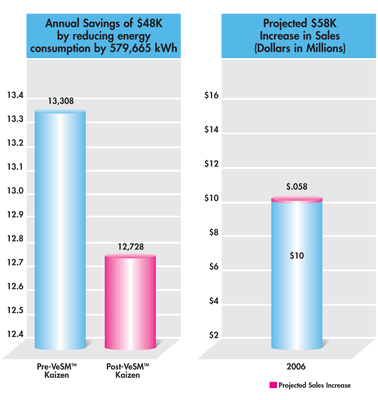 In addition, the calculated energy savings were 579,665 kWh, approximately $48K.